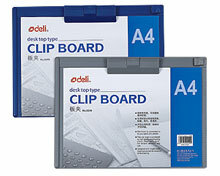 A clipboard, with a clip at the top, is slightly larger than a pad of standard sheets of paper. It is usually used in situations where good writing surfaces are unavailable. The clipboard is designed to support the pad of paper while writing. 1. The imported clip is used to fix the sheet of paper. 2. Penholder design will give the user more convenience. 3. Multiple colors, ease of use. 4. Our clipboard achieves high flexibility. 5. This clipboard is suitable for use in factories, workshops, schools, etc. Founded in 1988, we at Deli Stationery is an experienced clipboard manufacturer and supplier in China. In order to meet the needs of our customers, we produce a great variety of products, such as stapler, paper punch, binder clip, desktop set, pencil case, pen bag, clipboard, and so on. Thanks to the continued efforts of our dedicated staff, we are able to provide high quality office supplies at economical prices. Thank you for browsing our website. We welcome you to contact us for more product information.